Whether you're making toast for breakfast or preparing a late-night sandwich after a night out, one of your first steps is to reach for a loaf of bread. If you aren't fond of the gummy texture of white bread, you might prefer using whole-wheat bread. This variety often has a sweet, nutty taste and is marketed as being a healthier alternative to white bread. 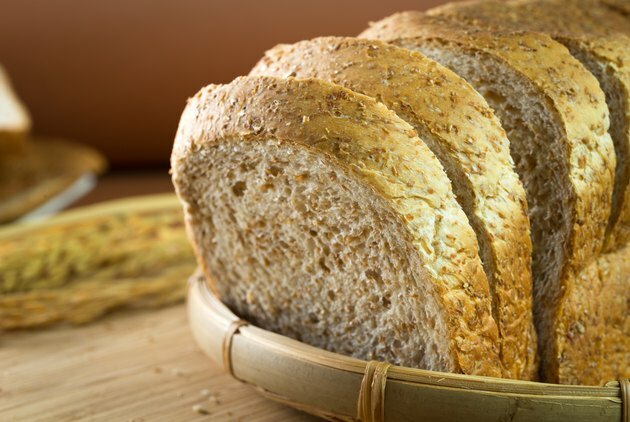 The caloric content of both breads is similar, but whole-wheat provides more fiber and nutrients than white bread. One slice of whole-wheat bread that weighs 32 grams contains 81 calories, according to data from the U.S. Department of Agriculture. A slice of commercial white bread that weighs 30 grams, by comparison, has 80 calories. When shopping for bread, remember the USDA's guidelines are general, and a bread's weight, ingredients and brand can influence the exact number of calories it contains.